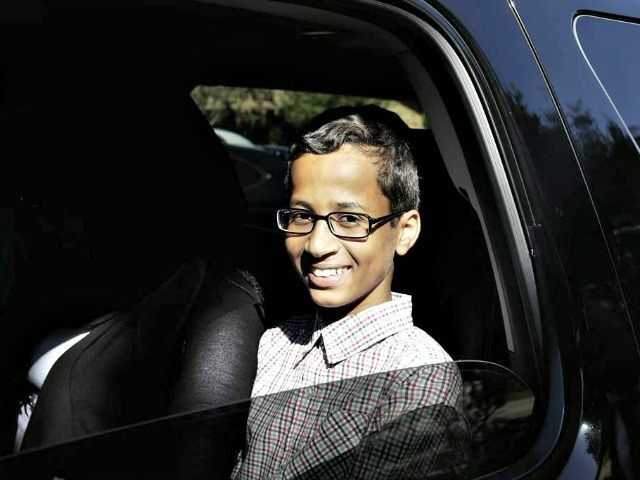 'Clock Boy' Ahmed's Demand Letter: Pay Up or Else! “Ahmed clearly was singled out because of his race, national origin, and religion,” asserted Kelly Hollingsworth, a Laney and Bollinger personal injury law firm attorney who, in his letters on the family’s behalf, insisted the teen was arrested wrongfully for bringing to school the homemade, unassigned suitcase clock initially thought to be a “hoax bomb.” Once sorted out, the teen was released and only served a three day out of school suspension in accordance with the school’s Student Code of Conduct. The letter claims school and city officials reacted as they did because Mohamed was Muslim and Sudanese. “Let’s face it; if Ahmed’s clock were ‘Jennifer’s clock,’ and if the pencil case were ruby red bedazzled with a clear rhinestone skull and crossbones on the cover, this would never have happened,” Hollingsworth contended, echoing allegations made by Alia Salem, director of the Dallas chapter of the Council on American-Islamic Relations (CAIR). On Sept. 18, she decried that if Ahmed’s name were “Jimmy,” Irving school district officials never would have jumped to the “hoax bomb” conclusion. Hollingsworth insisted that zero tolerance policies did not apply to Ahmed Mohamed because he “never threatened anyone” and “never intended to.” Although an unrelenting liberal media promulgated the Islamophobia narrative, the Associated Press finally cited zero tolerance for Ahmed’s arrest. The Huffington Post acknowledged the role zero tolerance played. Even a cadre of experts highlighted zero tolerance’s impact on the teen’s woes for the Dallas Morning News, which otherwise offered up glowing Ahmed coverage while trashing the school district and city officials, most notably Irving’s mayor, Beth Van Duyne. “The only one who was hurt that day was Ahmed, and the damages he suffered were not because of oversight or incompetence. The school and city officials involved knew what they needed to do to protect Ahmed’s rights. They just decided not to do it,” Hollingsworth alleged. The demand letter accuses the city’s mayor Beth Van Duyne of previously “stoking the flames of Islamophobia,” however, two days after the arrest, the Dallas chapter of the Council of American-Islamic Relations (CAIR) hosted a press conference on the Mohamed family’s Irving residence’s front lawn, positioning Ahmed as the victim of racism and bigotry. CAIR’s Alia Salem introduced her “civil rights advocacy group” as “helping to get Ahmed’s story out.” Constitutional Law Center for Muslims in America lawyer Linda Moreno, spoke to the media on his behalf, although before month’s end denied she represented the 14-year-old or his family. Yahoo News! reported that Ahmed’s father Mohamed Elhassen Mohamed served pizza to news media. Van Duyne received disturbing sexually violent and vile online threats. The Mohameds never signed the school district’s privacy release form that would allow officials, otherwise silenced by federal student privacy law protections, to tell their side of the story. The letter alleges school district officials attempted to force the family to sign. The Dallas Morning News insisted the the Mohamed family never signed the waiver because it was sent to the wrong lawyer. Further silencing city and district officials was Democratic Northern California Congressman Mike Honda’s call for a U.S. Department of Justice probe into the Irving school district and police department that handled the arrest. This, despite the fact that no charges were ever filed against Mohamed. U.S. Attorney General Loretta Lynch since opened an inquiry. Which campaign was that? From the get-go, news organizations like CNN blasted out Muslim teen Ahmed Mohamed creates clock, shows teachers, gets arrested. They threw him a failed fundraiser. TIME named him one of 2015’s top 30 most influential teens. The local Dallas newspaper characterized Ahmed as the severely traumatized yet “self-assured kid with thick framed glasses” with “a talent for tinkering,” a victim of racism and bigotry. Mainstream media gleefully portrayed Ahmed’s meetings with Turkey’s Islamist Prime Minister Ahmet Davutoğlu and Sudan’s Islamic genocidal leader Bashir. They celebrated the teen’s Saudi government funded Mecca pilgrimage and delighted in his tour of Education City, a gift from the Muslim Brotherhood-associated Qatar Foundation, and his White House Astronomy night visit. The media concerns appear to include Van Duyne’s appearance on the Glenn Beck program and a “Clock Boy” Halloween costume. Over Twitter, Ahmed confirmed the Dallas Morning News headline that he accepted a Qatar Foundation paid vacation to Education City. He shared adventures with new friends at the Qatar Foundation. The teen announced his Instagram account for the official I Stand with Ahmed Report for “my updates” and tweeted about his Saudi government funded Mecca pilgrimage. Hollingsworth insists the family “all of them want more than anything to come home to Irving, Texas.” Ahmed accepted a full scholarship to attend a Qatar Foundation school and the family relocated to Qatar. The letters to the City of Irving and Irving ISD, which include more allegations than addressed above, follow this story.